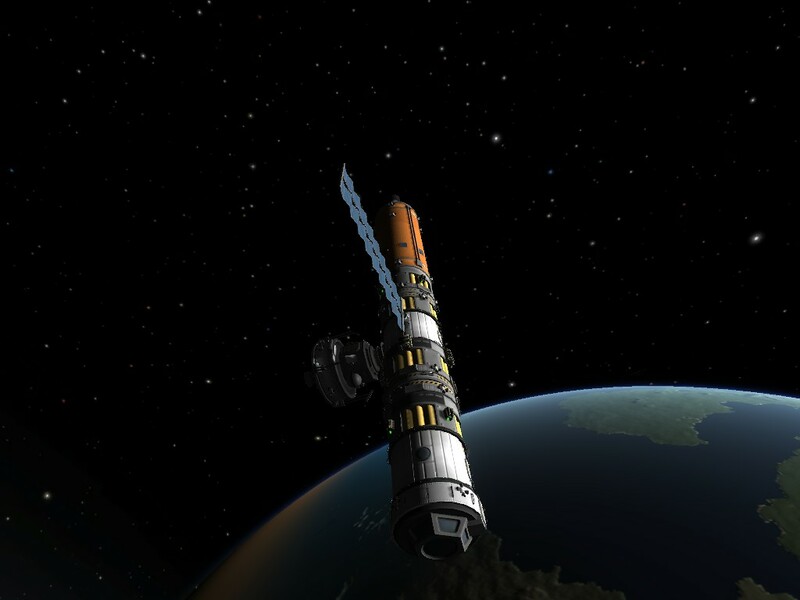 I started by launching my central module into a 200 km equatorial orbit. Once it was placed, I opened up the solar panels (because they look awesome) and began designing my crew module. I used constructed it with a Hitchhiker module (capacity: 4 Kerbals) to supplement the one in the central module, and a cupola module so my Kerbals can sit in there and look out at the stars and planets. Yay! It even looks like a space station. I’ve got no actual use for all that solar electricity, though. The panels just look cool. 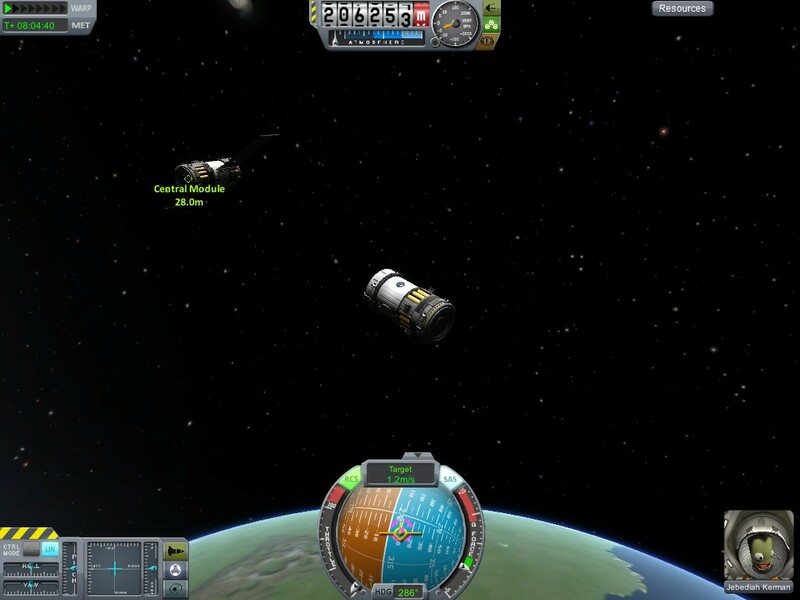 The first orbital docking went quite smoothly. The pieces were both relatively small and maneuverable, so I didn’t have a lot of trouble lining them up. The Hitchhiker pods launch empty, so there’s only one Kerbal aboard right now. 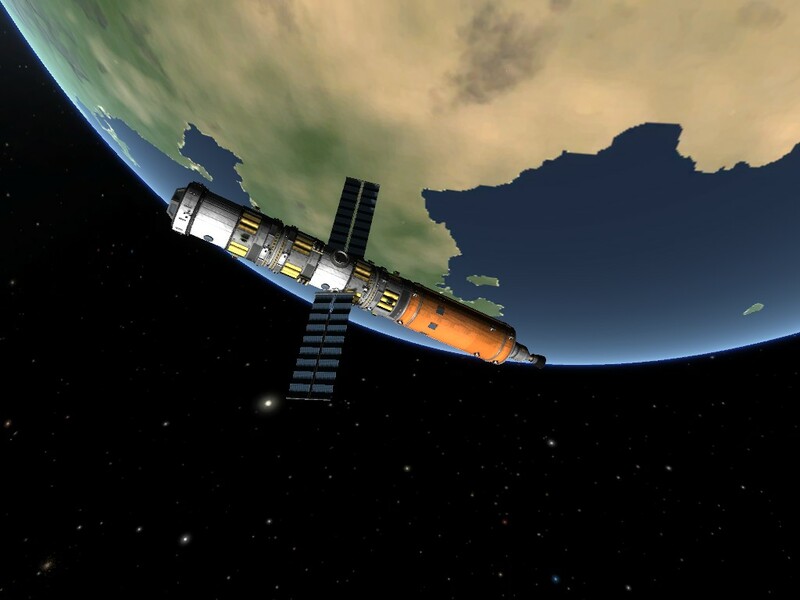 The next module was a fuel supply module, followed by a crew shuttle carrying another three brave Kerbals. This picture gives a good view of the cupola, and the docked crew shuttle. The fuel in extremely heavy, and while the atomic engine is by far the most efficient in the game, it doesn’t produce much thrust, so designing a launch vehicle was difficult. 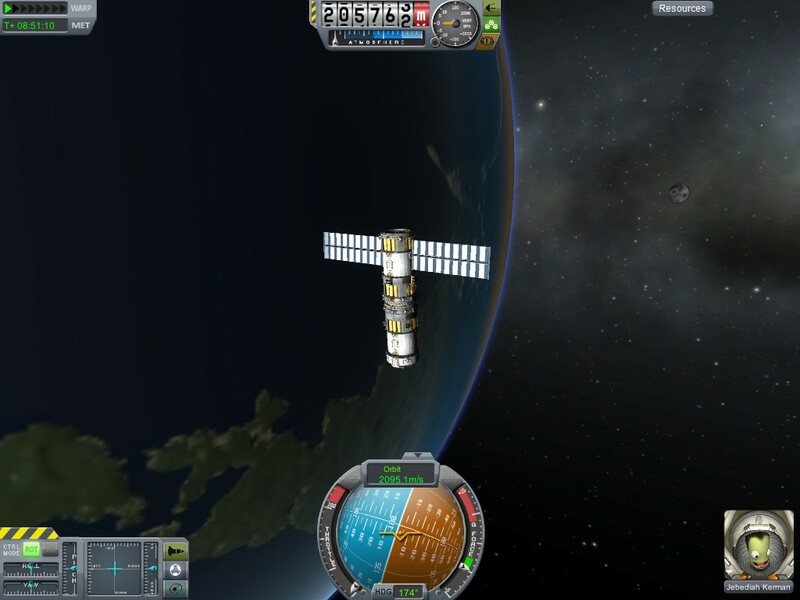 However, after some trial and error I was able to get it into orbit, when the true test of my skills would begin. See, by this point both the engine/fuel module and the station were very long, and had a horrible tenancy to rotate out of position while I was trying to line up the docking ports. 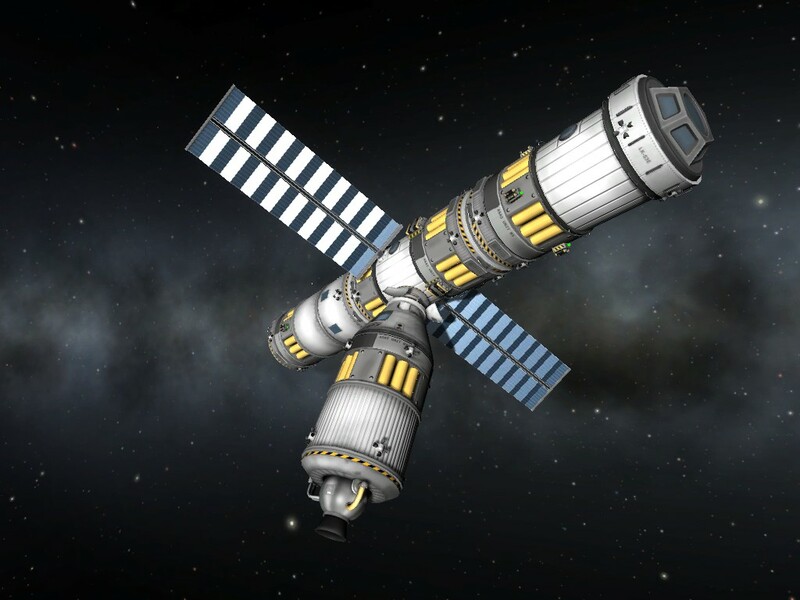 My attempts literally took hours, and I eventually ran out of RCS thruster fuel in the engine module, and had to detach the fuel tank already docked to the station, to replenish it and reduce the overall length of my station. The fuel tank is the big orange one. I finally got it docked, and I was ready to move into the final stages of my plan. You see, my space station is actually…A space SHIP. Yeah! Once my station ship was nearly done, I did some calculations and realized that this fuel/engine combination could produce enough delta-V to move the whole thing into orbit around the planet Jool (a gas giant with multiple moons. Think Jupiter) and do some exploration there. Loaded up, and ready to depart. To that end, I sent up a final supply run to top off the fuel tanks, and then docked a small Lunar Exploration Vehicle, so that I can send a Kerbal to some of the moons of Jool without having to move the whole station/ship. I don’t know if it will have enough fuel to land and return from the larger moons, but I think it can visit at least one. Next Time: To the Mun!